Active adults and retirees living in Georgia, or those looking to relocate to the area should consider one of the many active adult communities in the Atlanta area. With more than 20 communities in and around the Atlanta area, active adults have numerous choices when it comes to what type of active adult community they want to live in. The city s warm weather climate is ideal for many retirees from northern states who want to live in a mild climate while still getting a taste of four seasons. As a result, the Atlanta area has provided a great retirement community for out-of-state residents as well as native Georgians who want to stay close to home, as well as friends and family. Some of the more popular Atlanta area active adult communities include Sun City Peachtree, Del Webb Lake Oconee, and Cresswind at Lake Lanier. The Atlanta area has a humid subtropical climate with four distinct seasons. Summers are consistently hot and humid, with July nights averaging 71 degrees and afternoons averaging 89. January lows are normally in the low 30 s and highs average near 52 degrees. Snow is uncommon, but an occasional dusting has been known to happen once or twice a year. The area experiences around 50 inches of rain annually. Atlanta is the ninth largest metropolitan area in the county and is home to just over 5 million people. Situated at the foothills of the Appalachian Mountains, Atlanta encompasses approximately 132.4 square miles. With a vibrant downtown area and sprawling suburbs, active adults can choose to live the big-city life or enjoy a slower pace just outside the city. Most of the active retirement communities in Atlanta are being constructed in the suburban regions surrounding the city. Most of the Atlanta active adult communities are within an hour's drive of downtown and many are located on the city s north side. The Atlanta area has attracted active adults in recent years because it offers the conveniences of a large city and it is a major cultural and entertainment hub. Atlanta hosts a variety of museums, theaters and art galleries. The Georgia Aquarium, Fox Theater, and Atlanta Symphony Orchestra are among some of the more popular cultural attractions. 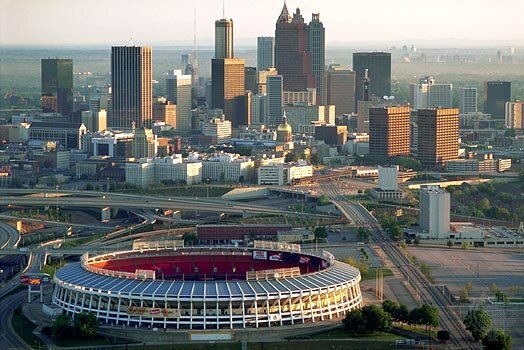 Sports fans are fond of Atlanta for its many professional sports teams. The Atlanta Braves (baseball), Atlanta Hawks (basketball) and Atlanta Falcons (Football) are all located in downtown Atlanta. Golfers love the area for the numerous public and private courses in and around Atlanta with play available for all skill levels. The Peachtree Road Race is the world s largest 10-kilometer race and is held annually on Independence Day. With more than 30 colleges and universities in the Atlanta area active adults looking to further their education can do so easily. Georgia State University, Georgia Tech University, and the Savannah College of Art & Design are all located in Atlanta and offering continuing education for active adults. The cost of living in the Atlanta area is about on par with the national average. Georgia has a progressive tax structure with six groups that range from one to six percent. The state sales tax on goods is four percent. There is no sales tax on prescription drugs, approved medical devices, and food items for home use. However, there is a tax levied on alcohol, tobacco, and motor fuel. Property taxes are paid to the county in which the residence is located. The Atlanta area offers some of the best medial services and healthcare opportunities in the state of Georgia. With approximately 60 hospitals in the area active adults are never too far from the medical attention they may need. Emory University Hospital was ranked 11th in country for adult specialties which include such practices as cardiac care, diagnostic radiology, and neurosciences.